Sergio Aguero is looming as an indispensable figure in Manchester City's title defence, with Pep Guardiola praising the striker's "perfect" conditioning. The Argentina star continued his sparkling early season form with a classy hat-trick in the 6-1 thumping of Huddersfield Town on Sunday. It was his ninth treble in the Premier League - a tally second only to Alan Shearer - and came just a fortnight after a decisive brace in the Community Shield win over Chelsea. Though consistently prolific, City's all-time top scorer has not always been a Guardiola favourite and started just 22 league matches last term. But the City boss looks set to reward the 30-year-old with greater responsibility this season after he returned from knee surgery in top shape. "Since he came back, I saw it from the first second, from the first minute, wow, he came back perfect," Guardiola told Sky Sports. "The surgery from Dr [Ramon] Cugat helps us a lot because he feels free now and he suffered the last years with some problems. "It's not just that he scores goals... he creates chances, moves, assists, passes. He never stops. "When this happens, Sergio is one of the best, best, best, best strikers in the world, without a doubt. This period since we arrived, the Community Shield, Arsenal, today, it's perfect." The former Atletico Madrid man partnered Gabriel Jesus in attack to fine effect on Sunday, the Brazi forward grabbing a goal of his own amid the carnage. 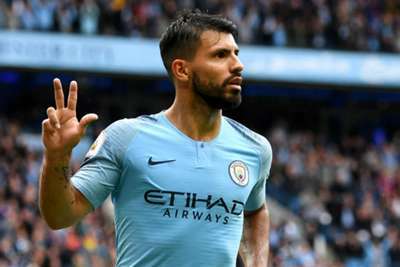 Aguero insists he is not concerned about losing his place should Guardiola revert back to a lone central striker, telling Sky: "I have to train hard, and then it is the decision of the manager. "When I play, I have to be the best." 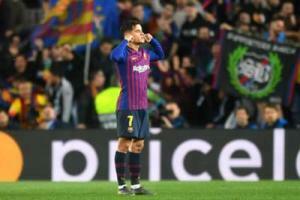 Philippe Coutinho caused a stir with a controversial celebration following his sublime goal in Barcelona's win over Manchester United.